How did you become a zoo keeper? I have always wanted to work with animals. I badgered my local vet until he finally gave in and just before my 16th birthday I started working part time in Castle Veterinary Clinic in Clondalkin. I worked there for seven years both part time and full time gaining invaluable animal experience. Then I studied Biology in college in Institute of Technology in Tallaght. The zoo luckily took me on straight after college as I had both relevant animal experience and a relevant qualification. Generally I work in the South American section on the East side of the zoo. I also do the sea lion training daily. I am also in the office a lot at the moment while covering maternity leave for the registrar. I am very lucky however as I have worked with nearly every type of animal in the zoo from elephants to guinea pigs over the last 10 years. I’m responsible for the feeding, cleaning, health and habitat maintenance of all the South American primates, sloths, tortoises, iguanas, military macaws, tapirs, rhea and mara. I also look after the red pandas and assist with the sea lion training daily. Which are your favourite animals in the Zoo? I just love the Bolivian squirrel monkeys – they are so mischievous and full of life. The epitome of a cheeky monkey! And I’m also very fond of the tapirs – they are just so easy going! I have three dogs and two cats that all get on great with each other. They are all strays and waifs I acquired over the years – I just couldn’t say no! Can you tell us one of your most Exciting/Funniest/Most Memorable moments in the Zoo? 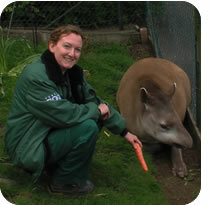 I have had so many amazing experiences since I started working in the zoo, it’s really hard to pinpoint just one! The birth of any animal is always amazing but in particular the birth of the first elephant born in Ireland - Asha was amazing. There was such a buzz among all the staff and the zoo was electric that day! It’s always an incredible feeling to bond with such wonderful animals and feel you are making a difference to that individuals life and also to the species as a whole. It is such a unique job, there is nothing that can compare to it, I just couldn’t imagine doing anything else. I love the animals, I love that the job is so physical, I love working with like minded people and the camaraderie, I love that I am doing a job that is actively making a positive difference to an animal’s life. What’s the most difficult thing about your work? Without a doubt, the death of an animal is the worst aspect of the job. Generally, I try to keep some kind of emotional distance but it’s so hard not to become attached to animals and there’s always favourite animals that you may have worked with everyday for years. They become friends and it can be devastating to have to say goodbye. When you’re not working in the zoo, what other hobbies or interests do you have? My life seems to revolve around animals and being outside. If I’m not in the zoo, I’m at home looking after my own animals or out hiking and walking. I also love socialising and spending time with my family and friends. Moondance are delighted to anounce that the Zoo TV Series, Series 1,2 &3 DVD Box set is now available to purchase from Tesco Ireland and The Dublin Zoo Gift Shop.